Colleen Rose Dewhurst (3 June 1924 – 22 August 1991) was a Canadian-American actress. She is known most for theatre roles, and for a while as "the Queen of Off-Broadway". In her autobiography, Dewhurst wrote: "I had moved so quickly from one Off-Broadway production to the next that I was known, at one point, as the 'Queen of Off-Broadway'. This title was not due to my brilliance, but, rather, because most of the plays I was in closed after a run of anywhere from one night to two weeks. I would then move immediately into another." She was a renowned interpreter of the works of Eugene O'Neill on the stage, and her career also encompassed film, early dramas on live television, and Joseph Papp's New York Shakespeare Festival. One of her last roles was playing Marilla Cuthbert in the Kevin Sullivan television adaptations of the Anne of Green Gables series, and her reprisal of the role in the subsequent TV series Road to Avonlea (marketed as Avonlea in the US). Dewhurst won two Tony Awards and four Emmy Awards for her stage and television work. South Salem, New York, U.S.
Colleen Dewhurst was born 3 June 1924, in Montreal, Quebec, to housewife Frances Marie (née Woods) and Ferdinand Augustus "Fred" Dewhurst. She had no siblings. Fred Dewhurst was the owner of a chain of confectionery stores, and wife Frances' father had been a celebrated athlete in Canada, where he had played football with the Ottawa Rough Riders". The family became naturalized as U.S. citizens before 1940. Colleen's mother was a Christian Scientist, a faith Colleen also embraced. The Dewhursts moved to Massachusetts in 1928 or 1929, staying in Boston, Dorchester, Auburndale, and West Newton. Later they moved to New York City, and then to Whitefish Bay, Wisconsin. She attended Whitefish Bay High School for her first two years of high school, moved to Shorewood High School for her junior year, and finally graduated from Riverside High School in Milwaukee in 1942. Around this time, her parents separated. Dewhurst went on to attend Milwaukee-Downer College for two years before moving to New York City to pursue an acting career. With Brooks Atkinson's blessing, our world changed overnight. Suddenly in our audience of neighbors in T-shirts and jeans appeared men in white shirts, jackets and ties, and ladies in summer dresses. We were in a hit that would have a positive effect on my career, as well as Joe's, but I missed the shouting. She played Shakespeare's Cleopatra and Lady Macbeth for Papp and, years later, Gertrude in a production of Hamlet at the Delacorte Theatre in Central Park. Dewhurst and George C. Scott met while working together in 1958, in Children of Darkness, while they were both married to other people. She appeared in the Alfred Hitchcock Presents episode Night Fever in 1965 and with Ingrid Bergman in More Stately Mansions on Broadway in 1967. José Quintero directed her in O'Neill's Long Day's Journey into Night and Mourning Becomes Electra. She appeared in Edward Albee's adaptation of Carson McCullers' Ballad of the Sad Cafe, and as Martha in a Broadway revival of Who's Afraid of Virginia Woolf, opposite Ben Gazzara which Albee directed. She appeared in 1962 as Joanne Novak in the episode "I Don't Belong in a White-Painted House" in NBC's medical drama, The Eleventh Hour, starring Wendell Corey and Jack Ging. 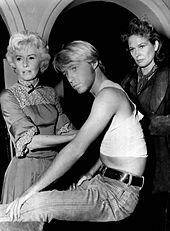 Dewhurst appeared opposite her then-husband, Scott, in a 1971 television adaptation of Arthur Miller's The Price, on Hallmark Hall of Fame, an anthology series, and there is another television recording of them together when she played Elizabeth Proctor to his unfaithful John in Miller's The Crucible (with Tuesday Weld). In 1977, Woody Allen cast her in his film Annie Hall as Annie's mother. In 1972, she played a madam, Mrs. Kate Collingwood, in The Cowboys (1972), which starred John Wayne. In 1985, she played the role of Marilla Cuthbert in Kevin Sullivan's adaptation of Lucy Maud Montgomery's novel Anne of Green Gables, and reprised the role in 1987's Anne of Avonlea (also known as Anne of Green Gables: The Sequel), and in several episodes of Kevin Sullivan's Road to Avonlea. Dewhurst died before the character of Marilla could be written out and her final scenes were picked up off the editing-room floor and pieced together for her death scene. During 1989 and 1990, she appeared in a supporting role on the television series Murphy Brown playing the feisty mother of Candice Bergen's title character; this role earned her two Emmy Awards, the second being awarded posthumously. Dewhurst won a total of two Tony Awards and four Emmy Awards for her stage and television work. She was president of the Actors' Equity Association from 1985 until her death. Dewhurst was married to James Vickery from 1947 to 1960. She married and divorced George C. Scott twice. They had two sons, Alexander Scott and actor Campbell Scott; she co-starred with Campbell in Dying Young (1991), one of her last performances. During the last years of her life, she lived on a farm in South Salem, New York, with her partner, Ken Marsolais. They also had a summer home on Prince Edward Island, Canada. Colleen looked like a warrior, so people assumed she was the earth mother. But in real life Colleen was not to be let out without a keeper. She couldn't stop herself from taking care of people, which she then did with more care than she took care of herself. Her generosity of spirit was overwhelming and her smile so dazzling that you couldn't pull the f_-kng reins in on her even if you desperately wanted to and knew damn well that somebody should. Dewhurst died of cervical cancer, age 67, at her South Salem home in 1991. She was cremated and her ashes were given to family and friends; no public service was planned. Over the course of her 45-year career, Dewhurst won the 1974 Sarah Siddons Award for her work in Chicago theatre, two Tony Awards, two Obie Awards, and two Gemini Awards. In 1989, she won the Genie Award for Best Performance by an Actress in a Supporting Role for her role in Hitting Home. Of her 13 Emmy Award nominations, she won four. She was inducted into the American Theatre Hall of Fame in 1981. 1977: Tony Award for Best Performance by a Leading Actress in a Play - Who's Afraid of Virginia Woolf? Decoy Taffy one episode: "Deadly Corridor"
Ben Casey Phyllis Anders one episode: "I Remember a Lemon Tree"
1962 The Eleventh Hour Joanne Novak one episode: "I Don't Belong in a White-Painted House"
The Virginian Celia Ames one episode: "The Executioners"
The Nurses Grace Milo one episode: "Fly, Shadow"
1964 East Side/West Side Shirley one episode: "Nothing but the Half Truth"
1965 Dr. Kildare Eleanor Markham one episode: "All Brides Should Be Beautiful"
The Alfred Hitchcock Hour Nurse Ellen Hatch one episode: "Night Fever"
1966 The F.B.I. Amy Doucette one episode: "The Baby Sitter"
The Big Valley Annie Morton one episode: "A Day of Terror"
1973 Wide World Mystery Margery Landing one episode: "A Prowler in the Heart"
1982 Quincy, M.E. Dr. Barbara Ludow one episode: "For Love of Joshua"
1984 Finder of Lost Loves Rachel Green one episode: "Echoes"
The Love Boat Maud one episode: "Welcome Aboard: Part 1 and 2"
1988 The Twilight Zone Alley Parker one episode: "There Was an Old Woman"
1989 Moonlighting Betty Russell one episode: "Take My Wife, for Example"
- "Of Corsets and Secrets and True, True Love"
-"The Materializing of Duncan McTavish"
-"The Quarantine at Alexander Abraham's" and "Old Friends New Wounds (Marilla's Death)"
Dewhurst, Colleen; Viola, Tom (1997). Colleen Dewhurst - Her Autobiography. Scribner. ISBN 978-0-684-80701-0. ^ "Show Business: Gorgeous Gael". Time. January 21, 1974. Retrieved April 30, 2010. ^ Colleen Dewhurst profile, Yahoo! Movies; accessed February 8, 2014.